The High Court of Madras, which is located in George Town locality of Chennai, is not merely a court, but it is an important historic and heritage structure. Ten years ago, when it was comparatively easy to get inside the court campus for an ordinary and common man like me, I had visited it and also wrote about it briefly. Nowadays, the access to the campus is restricted. The only way to visit the site is through the heritage walk that is conducted every month by Advocate Mr. N.L.Rajah. Through the walk curated by him, I was introduced to some of the heritage structures and features which could not be accessed earlier or those which were restored in the last decade. The historical information that I am going to provide in this article are referenced from the book "Madras Rediscovered" book written by Mr. S. Muthiah. 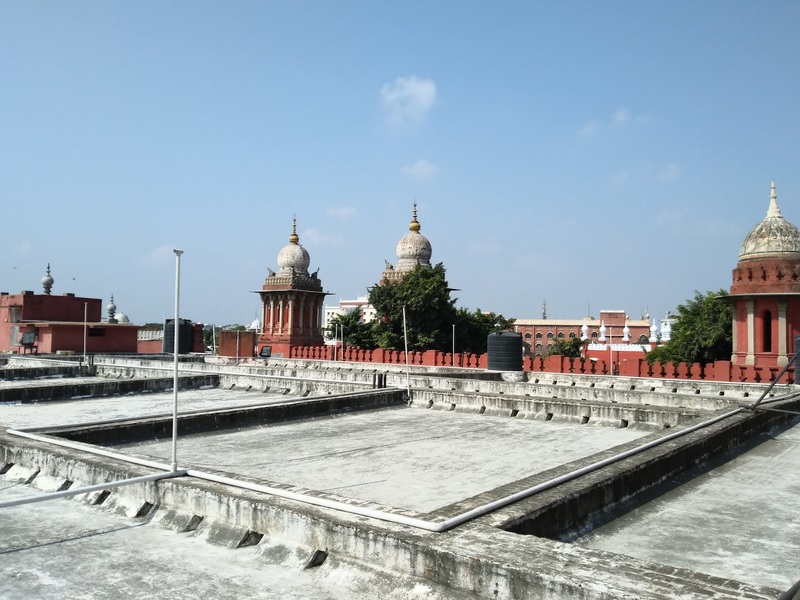 When the Britishers settled in Madras, there were Choultry Courts in the beginning. They are equivalent to today's Magistrate's Courts. In 1678, the Court of Judicature, which was presided over by the Governor, was established by Governor Streynasham Master. On 26th December 1800 CE, the Supreme Court was founded in the Choultry Gate Street of St. George's Fort. It was moved to Bentinck's Buildings in 1817. 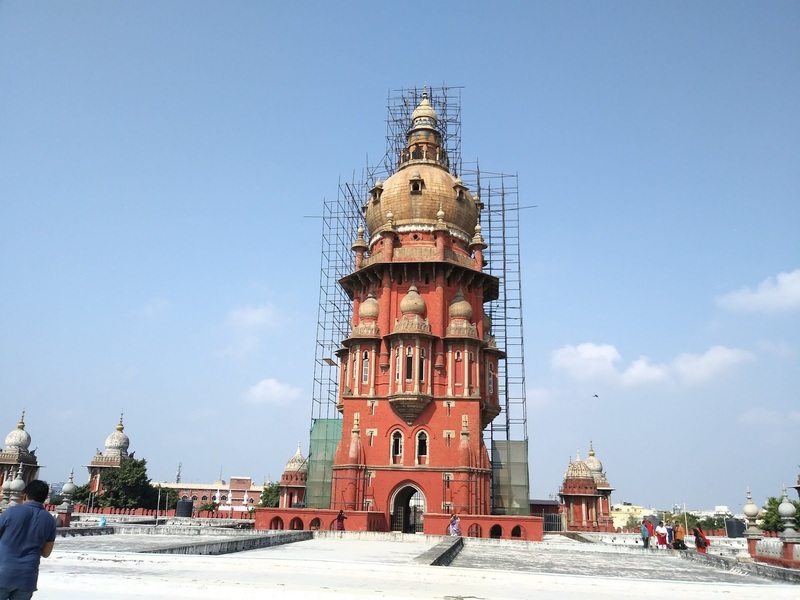 In 1862, a High Court was established for the Madras Presidency, taking over from the Supreme Court. Sir Colley Scotland, who was the last Chief Justice of the Supreme Court, became the first Chief Justice of the High Court. John D Mayne argued the first case. Raja T. Rama Rao was the first Indian advocate to be enrolled. 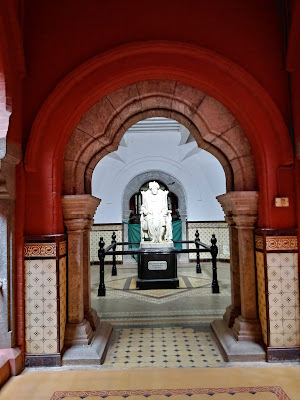 Sir Tiruvarur Muthuswami Aiyer was the first Indian to hold the offices such as the Acting Judge of the High Court in 1878 and then as the Puisne Justice in 1883. Later, he acted as the First Indian Chief Justice in 1891. The first Indian to be confirmed as the Chief Justice was Dr. Rajamannar in 1948. The first Indian Advocate General was V. Bashyam Iyengar in 1897. The site where the High Court stands today was previously the Esplanade. The Britishers brought the weavers and dyers from Nellore and Machilipatnam to Madras, thus forming the 'Black Town'. During the French occupation (1746-49), they started demolishing the structures in this area. There was another French invasion that happened in 1758-59. It was resumed by the British and by 1760, the entire locality was demolished. Its residents were moved to the nearby villages of Muthialpet and Peddanaickenpet. Thus, a new Black Town was formed. It is said that there was a Hindu temple in the site which was also demolished. It has resulted in the construction of the Twin Temples of Pattinam. To read more about this, click here. In 1772 CE, the southern boundary of the New Black Town was fixed with six obelisk stones. Construction beyond this boundary was not allowed by the British. This area was called as the Esplanade. The High Court was constructed in the site in the Esplanade area. The foundation stone was laid in 1889 and it was declared open for occupation on 12th July 1892. It took four years at the cost of Rs. 13 lakhs to construct the structure. 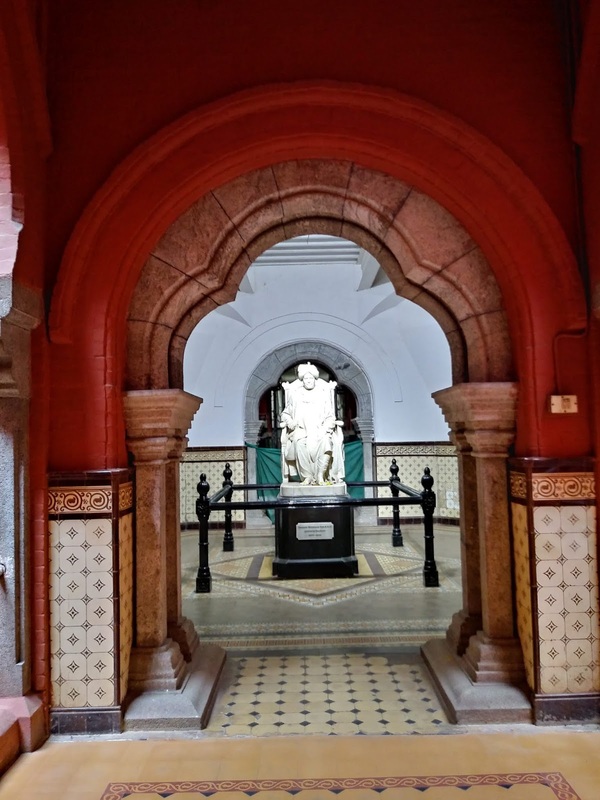 The High Court Museum which was started in 2000s is a recent attraction to this 125+ years old heritage campus. It is a must visit for those who are interested to get a detailed view of the history of the High Court, the list of Judges, few important judgment copies, the list of Sheriffs and similar information. 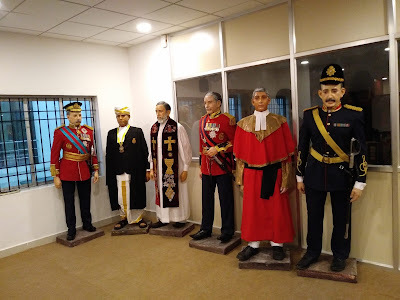 Some of the interesting displays include the portrait of the opening ceremony of the court by Baron Wenlock, who was accompanied by Sir Arthur Collins, Muthuswamy Aiyar, Parker, Wilinson and others. The wax images that depict the scene of Lord Wenlock handing over the keys to Chief Justice Arthur Collins are very interesting. 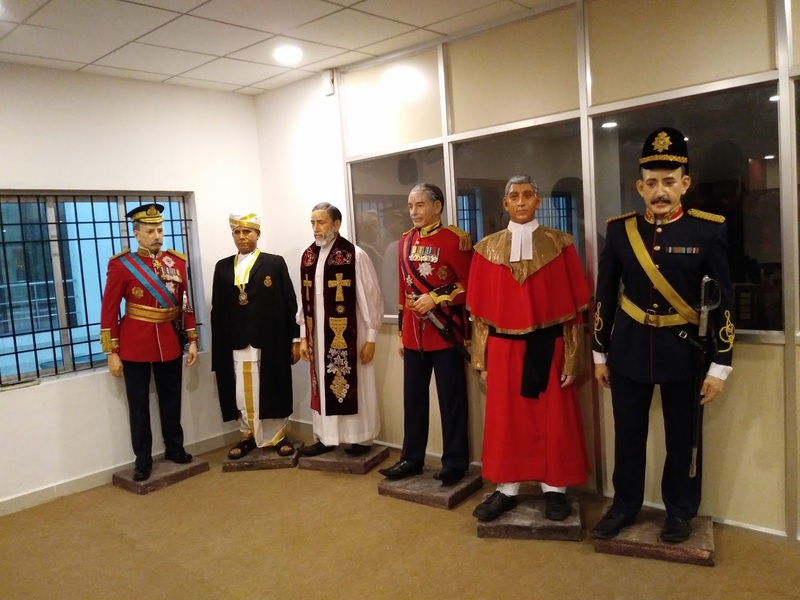 Some rare old photographs of High Court, the model replica of the entire structure, the model court hall and the model room of the Judge are some of the other interesting displays in the museum. Madras had four light houses. The first one was above the Fort St. George. 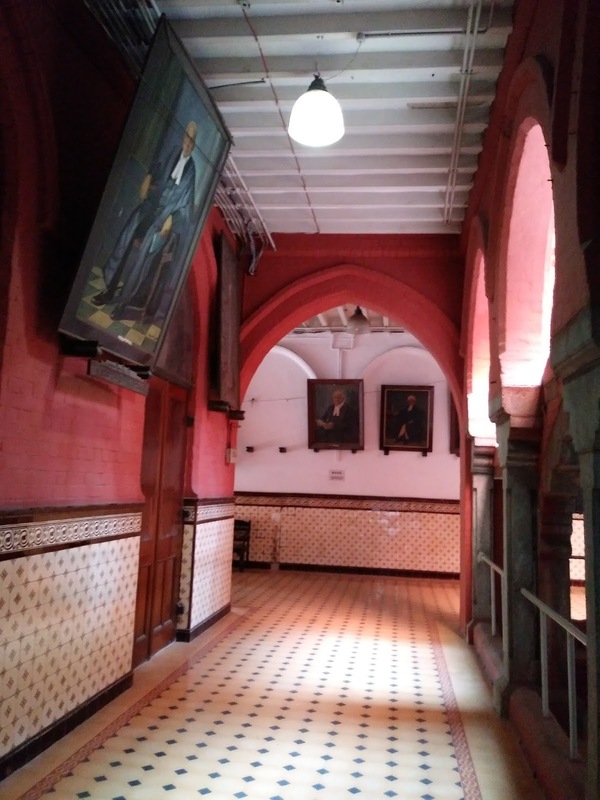 The second one is located within the court premises. It predates the court building. 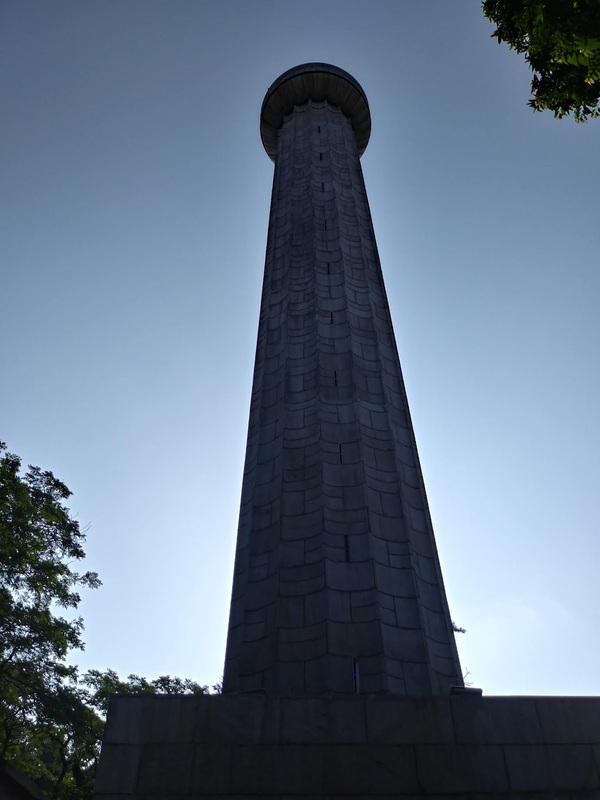 This 160 feet tall fluted Doric column was built from 1838 to 1844 CE. It was designed by Captain J.E. Smith. The spiral staircase is restricted now. In the recent past, this structure was restored and renovated. At the bottom, two rooms are kept which display various information about the city as well as some of the prominent lawyers and judges of the Court. Also, the block of stone, which marks the mean sea level, the standard bench mark for Madras used in the Great Trigonometrical Survey of India, is found. 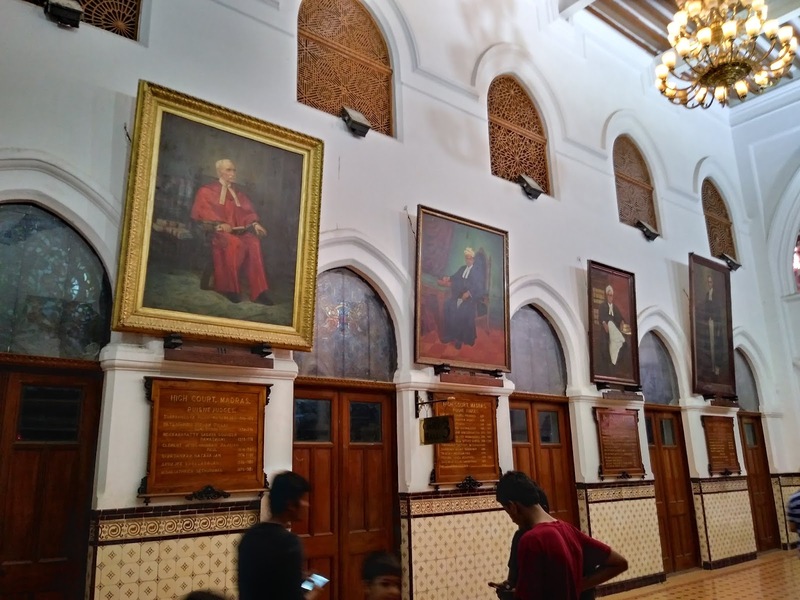 The buildings of the High Court of Madras are the fine examples of Indo Saracenic architecture. It's a combination of Hindu, Islamic and European style of architecture. The carvings are very beautiful. J. N. Brassington was the original designer. Henry Irwin developed those designs and J.H. Stephen, the engineer, supervised the construction and also made modification to the designs, as needed. 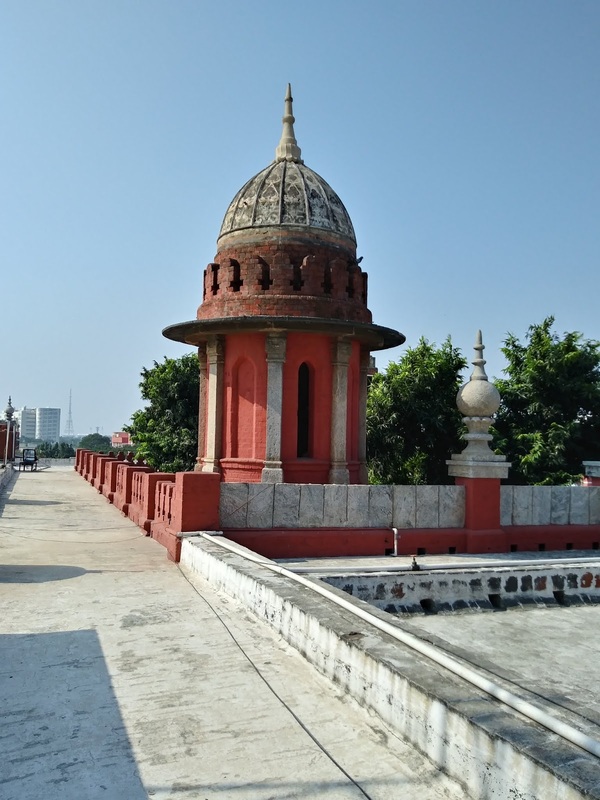 The tallest minaret of the court served as the third light house till 1970s. It is at 175 feet above sea level. It was established in 1894. This light house had attracted the German cruiser, the Emden and resulted in shelling of the city on 22nd September 1914. 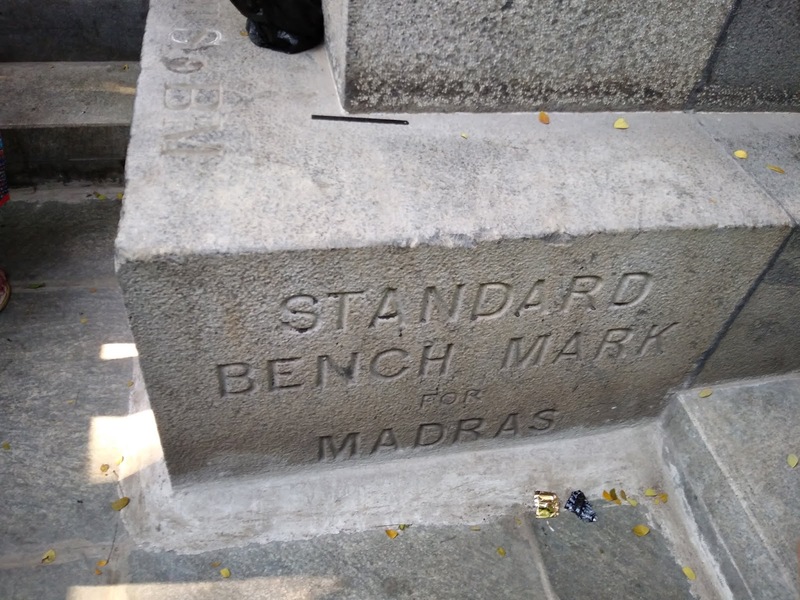 The Madras Advocates Association, which is located in the premises, was founded in March 1889. 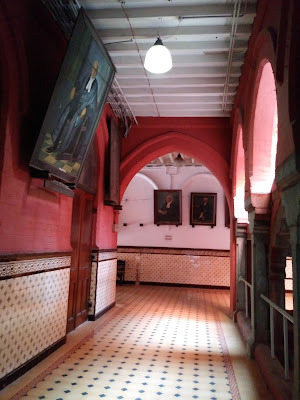 The library, the Madras Bars Association, the iconic Rajmannar hall, the court hall, the long corridors where the portraits of judges and lawyers are displayed, high ceiling and well decorated ceilings in few areas, ornate lintels and,the beautiful motifs and miniature carvings of the human and animal figures in the exterior walls and lot more are there to explore in this premises. Also, there are few prominent statues found within the court campus. Opposite to the old light house, the statue of V. Bhashyam Iyengar is found. 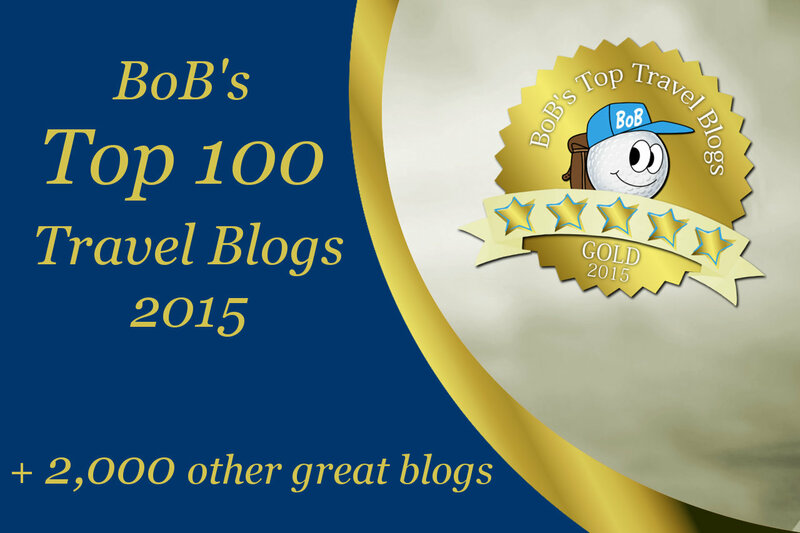 It is placed atop a lofty pedestal. He was the first Indian Advocate General and served as the Judge in the High Court later. His statue was installed in 1927, in spite of the opposition from the White judges. The grand marble icon of Tiruvarur Muthuswamy Iyer is treated like a deity by many lawyers. He served the High Court for from 1878 to 1895. He acted as the Chief Justice of the Madras High Court for three months. He was the first Indian to hold all these offices. His appointment as the Judge was condemned by the Madras newspaper "The Native Public Opinion" in those days. The iconic statue was installed three years after his death in 1898. He is founded seated on the Judge's seat with a turban on his head. He is found without footwear as he always used to remove his footwear before taking his seat when he was alive. P.V.Rajmannar was the first Indian to become Chief Justice of the Madras High Court after independence. He served in this post between 1948 and 1961. 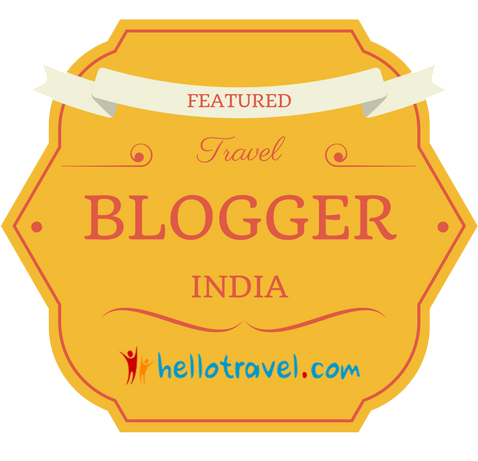 His bust was installed by Dr. S. Radhakrishnan, the then President of India, in 1963. 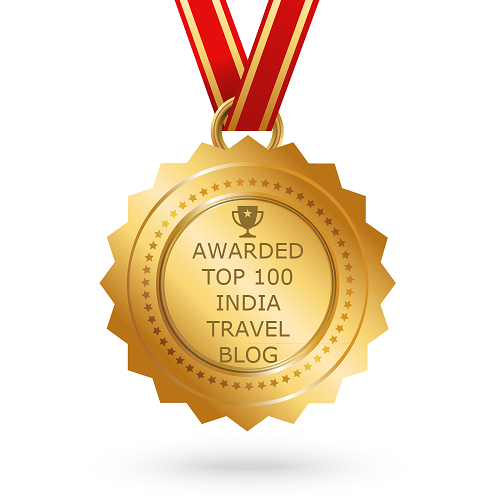 It is found at the entrance of the Rajmannar Hall. 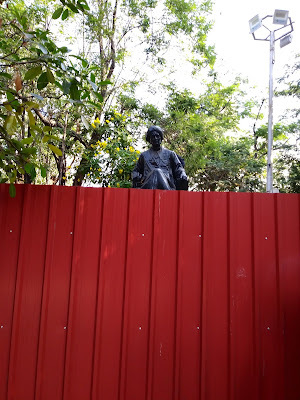 Manu Needhi Cholan's statue is a new addition. It was installed by Dr. P.C. Alexander, the then Governor of Tamil Nadu, in 1988. Chola is found in the standing posture; the cow ringing the bell, the calf killed by the chariot and his son who was executed by him in the same manner are all found around him.